Introducing your best Valentine’s Day Gift Ever. 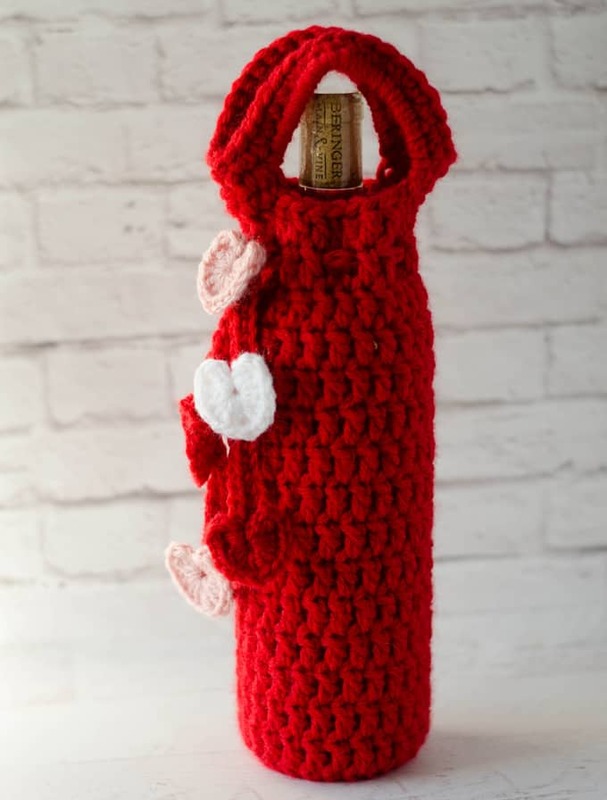 Meet the Crochet Bottle Cover ~ Valentine Wine Cozy. Pair it with a bottle of wine and these free Love Coupons and your gift giving is complete! Do you ever want to give that just perfect gift to the love of your life.. but you just want it to be easy? My friends, you are going to love, love, love today’s post. First up. 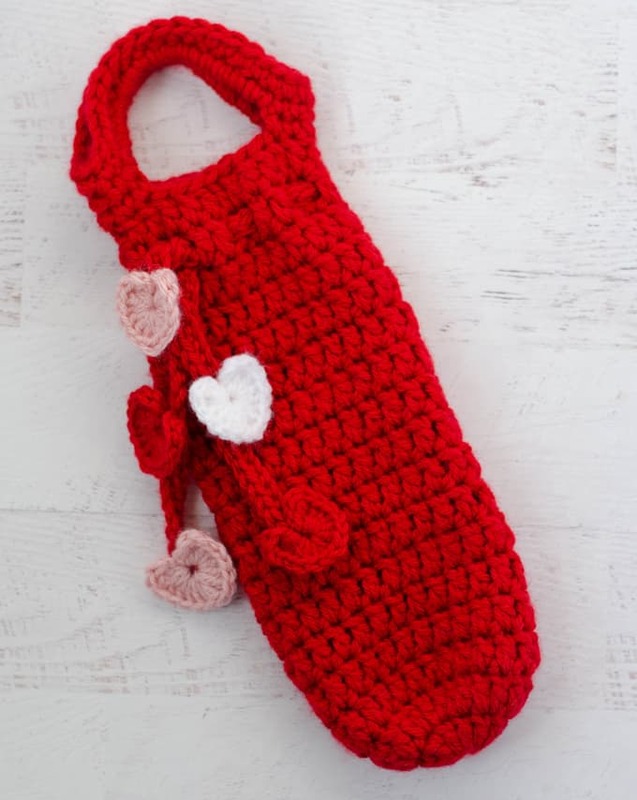 Make this sweet crochet bottle cover with adorable heart adorned tie. In one evening. Then fire up your printer and print these free Love coupons (scroll down for details). Pop in a bottle of your favorite wine and prepare to impress your love. Some days I feel like a pretty good wife. I say the nice things. Make good food. Do the laundry and make sure the house is clean. Other times I feel like I’m hanging on by a thread and crazy words are coming from my mouth because I’m stressed and tired, doing too many things at once. And I wonder why in the world this love of mine sticks around. But he does. He’s here for the highs and the lows and the sometimes crazy. He holds my hand. Calms my heart. Tells me we’re a team and it will be ok.
And how do you possibly buy something to show someone you love them that much right back? Sure you can buy candy. Maybe some expensive thing. But in my world, you make something amazing like this crochet bottle cover. And then you print out these little coupons for gifts of your time. You don’t need to spend a lot to show love. Sometimes you just need to DO. And maybe that’s the best gift of all. Download the FREE Love Coupons from my free resource library (you can get a password for it by signing up at the bottom of this page). The coupons are family friendly and will even work to give a child, sibling, parent or grandparent! Perfect for anyone you love! Let’s get started on the Valentine Crochet Bottle Cover! Scraps of worsted weight white and pink for the small hearts, sample used Vanna’s Choice brand in pink and white. R1: Using the larger (size J) hook 2 strands of red yarn, make a magic ring, chain 3 (counts as 1st dc) 11 dc in ring (12 dc total). Sl St to 1st st.
With red and one strand of yarn, chain 65, sc in 2nd chain from hook and across. Fasten off and weave in ends. Make a magic ring. Work the following all inside the magic ring: ch2, 2 tc, 5 dc, tc, 5 dc, 2 tc, ch 2, sl st to magic ring. Carefully pull the ring tight. The stitches will form a heart shape. Fasten off and use ends to sew on to tie in the next step. Starting at the left front as you are looking at the cozy, weave tie over and under 2 dc around row 16 and tie loosely. Carefully sew hearts on to ends of each tie and up the tie, referring to the photo for reference. Slip the crochet bottle cover on to a bottle of wine and carefully tighten up the tie. Looking for more wine cozy patterns? Click here for more free wine cozy patterns! 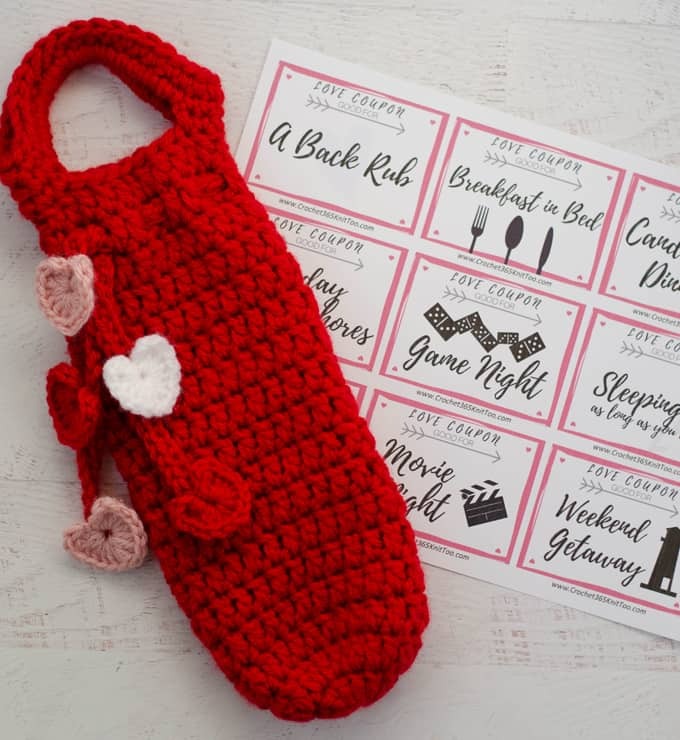 Subscribers to my Newsletter get Access to my secret library of freebies including these free Printable Love Coupons, a perfect accompaniment to the Valentine Wine Cozy! I love seeing your finished projects! 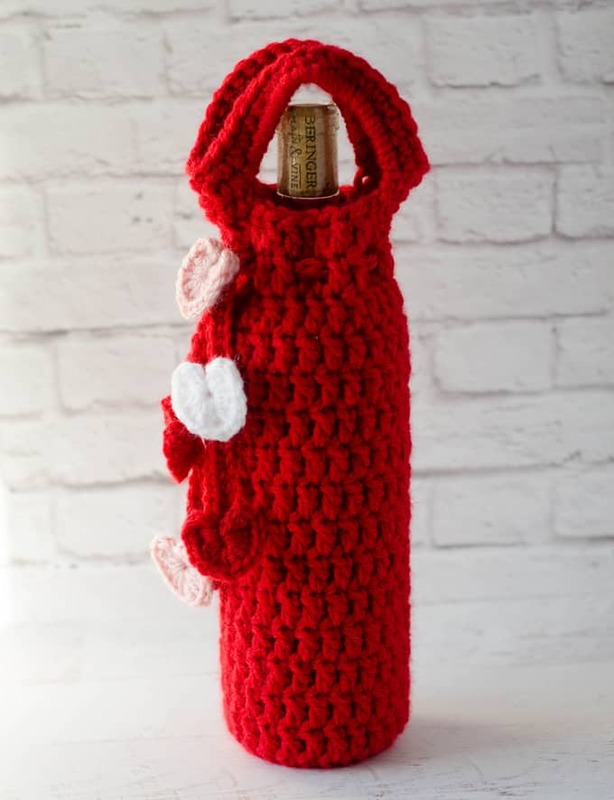 If you enjoyed making the Crochet Bottle Cover ~ Valentine Wine Cozy, I’d love to see yours on Instagram, be sure to tag me @crochet365knittoo. If you are on Facebook, stop over to the Crochet 365 Knit Too Facebook page or pop over to the Crochet365KnitToo Club and share a photo! I’d love to see your work! Written pattern copyright Cheryl Bennett 2019, all rights reserved. Please do not reprint or repost this pattern. 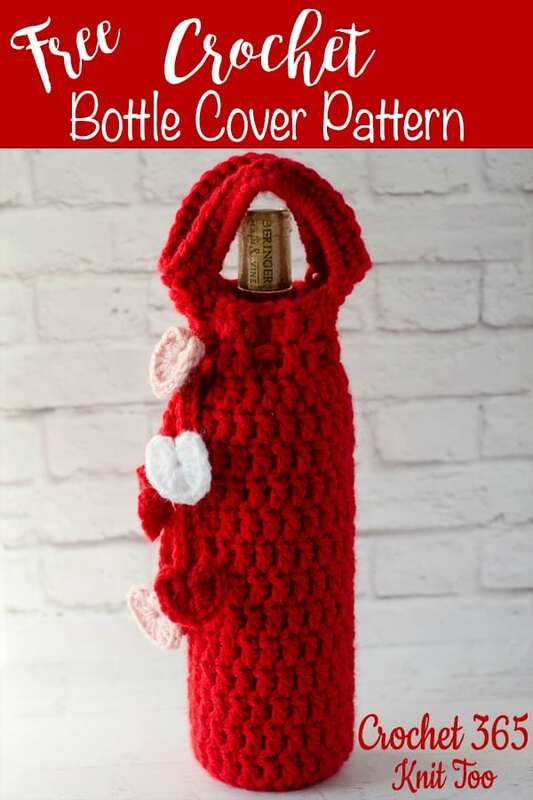 If you would like to share this Crochet Bottle Cover ~ Valentine Wine Cozy pattern with others, just link to this page. If you’d like to make items for sale from this pattern, please visit my About page for more information. I just finished making the Valentine wine cozy and it was so easy and turned out so cute. Those hearts are the easiest and best looking hearts ever. Thanks for the free pattern.